The autumn season represents change and reflection. Leaves fall to prepare the ground for hibernation, children go back to school, and a new harvest begins. Celebration of change, and gathering of loved ones and friends comes naturally during this time of year, which also makes fall a perfect season for weddings. Whether you’re just starting to plan your fall wedding, or you’ve moved deep into the process, there are many ways to embrace the magic of fall and make your wedding day one of the most beautiful of your long lives together. After all, what better way to move into this next phase of life than by starting in the season that represents change? Of course, no matter what time of year you plan a wedding, one goal is to make it memorable and fun for your guests. Giving wedding favors to your guests is a great way to thank them for supporting you on this important day, and to give them a memory of this special time for years to come. Here are a few ways to incorporate unique wedding favor ideas with the essential elements that go along with fall wedding planning. Back to school, Halloween, football season and Thanksgiving are just some of the important events that happen during the fall season. It’s definitely important to get your special date on your guests calendar early. But, it’s likely impossible to plan around all of these events. Instead of competing with the busy fall schedule, consider bringing aspects of the season into your celebration. 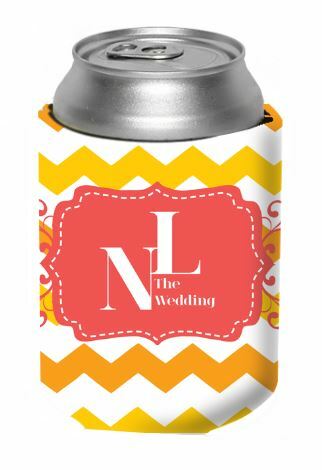 Personalized wedding koozies can be designed to celebrate holidays or favorite sports teams along with your wedding theme. They can include your names, wedding date, and clipart that incorporate images of the season like pumpkins, turkeys and cornucopias. You can also personalize koozies with logos and templates that align with the colors of football fanatic guests to help them feel connected to their team. If fans can choose from a koozie that matches their team allegiance, they will turn their attention to your important day instead of focusing on missing a game. This gift also shows how much you appreciate them being a part of your celebration. Autumn colors of deep orange, yellows and red reinforce the changing landscape and inspire outdoor ceremonies. The cooler weather makes it a pleasure to be outside in natural settings like a lakeside ceremony, rustic barn or quaint farm. While guests appreciate the cool, crisp air, they also appreciate enjoying drinks without their hands freezing on a chilly autumn night. 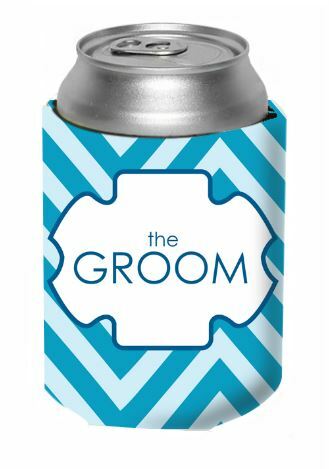 This is a perfect time to provide guests with wedding koozies custom designed with your wedding colors, pictures of the bride and groom or even the names of your guests so they feel especially loved and appreciated. Just imagine the cozy connection and memories that can be made with your guests sipping out of custom koozies around a bonfire on a cool autumn night. And, they not only benefit from using this gift during your wedding, but can take it home with them to savor the memory for years to come. Comfort foods begin to come into play during the fall with apple pie, hot cocoa, and the anticipation of Oktoberfest and Thanksgiving feasts. It’s a great idea to incorporate some of these flavors in your wedding menu, especially at the dessert table. In addition to traditional apple pie and pumpkin pie, consider a unique spin on a fall favorite and fill the table with his and her matching koozies stuffed with wrapped candy or caramel apples. Pink koozies for the bride and blue koozies for the groom remind your guests that this wedding is about bringing two families and two sets of friends together as one - and the extra element of a sweet treat represents the pleasantries of the season. Koozies can be customized with artwork, pictures, your names or simply “Bride” and “Groom.” Guests will enjoy making a decision on which koozie they want as they reflect on the fact that no matter who they came to see get married, they’re here for the both of you now. These personalized koozies not only give guests a unique wedding favor with a candy or caramel apple they can enjoy right away, they can also be used at the bar and filled with a brew of choice, hot apple cider, or even a hot toddie to keep them warm through your celebration. Although Autumn brings with it many opportunities for beautiful, natural scenery, you might want to break up the fall foliage with more personal decor and that can be one of the most expensive parts of a wedding reception. Adding wedding favors on top of custom decorations can take a toll on a wedding budget. 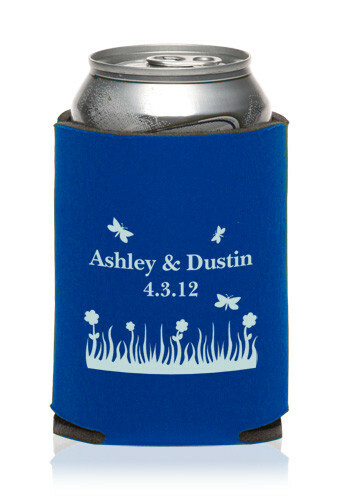 Low-cost wedding koozies can solve both of these needs. Koozies can be personalized with your wedding colors or favorite memories and used as centerpieces in lieu of an expensive vase. They are the perfect size to hold a bouquet of wildflowers or small fall foliage arrangement. Guests will appreciate the uniqueness of the wedding favor and having a take-home they can actually use. Elegantly arranging custom koozies near the drink-serving area also delivers a unique decoration and affordable wedding favor. Because the koozies can be personalized, you can create a fun atmosphere while guests are waiting to get a drink. This credit card koozie, for instance, pokes light fun at traditional marriage roles and lets your guests know that while you and your significant other love each other, you don’t take yourselves too seriously. The same goes for this “Kiss the Single Life Goodbye” koozie design, or this clever wordplay on this design. These jokes can be especially good for lightening the mood as your guests hold their drinks and get ready to have a great time. Buying koozies in large quantities will keep their prices low while guaranteeing that there are plenty to go around for your guests. 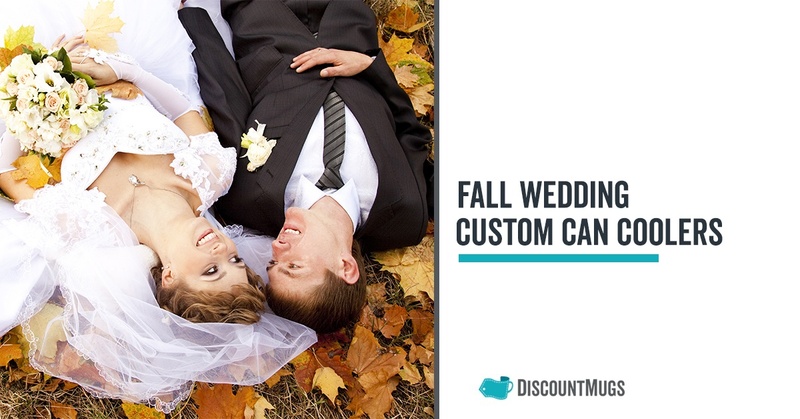 Plus, because you can customize every aspect of their design, they’ll fit in perfectly with the colors, words, fonts and design elements that match your fall wedding decoration style.